Sometimes kids turn out to be dangerous; they might just end up screwing your whole system. Well, you can’t blame them after all they are kids; we too were like that when we were small. They find computers colorful with lots of lights and buttons which tempt them to press and fidget with them. Some of the computer parts get damaged pretty quickly with a slightest mistake. The best example is the Optical drive. It’s sensible and can break easily if enough pressure is applied. It’s always said that precaution is better than cure. As usual softwares come to our rescue just like medicines during sickness. 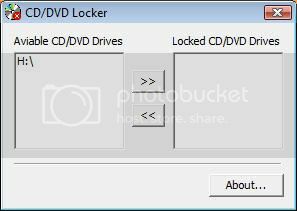 There’s a software known as CD / DVD Drive Locker which locks and protects your CD/ DVD drive. It protects the CD/ DVD by temporarily turning it off, and so pressing on the CD/DVD drive’s buttons doesn’t lead to the CD/DVD drive being ejected. CD / DVD Drive Locker is just 131KB in size and is compatible with Windows XP, Windows Vista & Windows 2000.